Anybody collect Paleontology related stamps: paleontologists, fossils, prehistoric animals, dinosaurs, early man, museums ? Let's share some stamps there ! (Cinderellas, illegal or commercial items are NOT welcome). 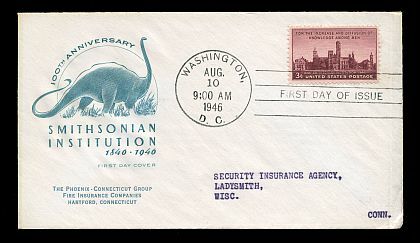 09.08.1946 , with this American FDC, and that the theme 'Prehistoric life in Philately' was born on this date. On this date, a stamp was issued to celebrate the centenary of the Smithsonian Institution. The stamp itself shows the Smithsonian's buildings in Washington (Actually this stamp itself can be consider as a stamp of paleontologic tematic as the Institue has very large Paleobiology Department . As illustration on the left side of the FDC shows a sauropod, most likely a Diplodocus.There are some variation of this FDC envelope, quite many various illustration are used at left side . It's a shame we just did a dinosaur My Collection (June issue), otherwise I'd snap you up for one. I just read the article, sent be me a fellow - the author Jon is very good collector too. BTW, Paleontology is not only Dinosaurs. 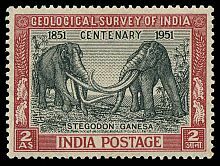 On commemoration of Indian Geological Survey centenary on 13th January 1951 Indian Postage released The stamp shows two individuals of Stegodon ganesa, the first ever reconstruction of a prehistoric animal on a stamp.It was valued 2 Anas.Ana the olden Indian coin was in use before 1956. In 1956 Indian Government introduced Paise the hundredth fraction of Rupee the currency.16 Anas are equal to One Rupee. An FDC envelope with these stamp has been issued as well. 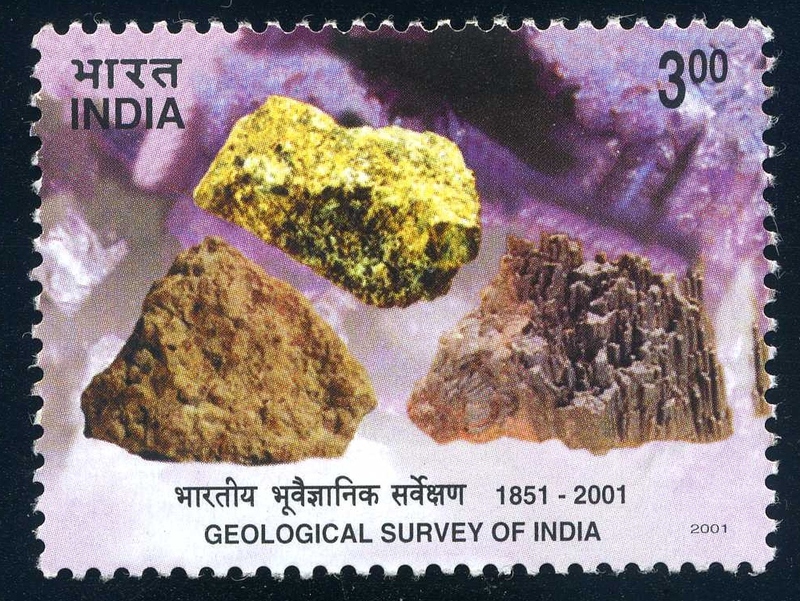 On March 4, 2001 a another stamp was issued by the Department of Post, Government of India , to commemorate 150 annuasary of Indian Geological Survey. This time geological motive has been choosed. In UK first stamps of dinosaurs are issued only in 1991. "150th Anniversary of Dinosaurs' Identification by Owen"
The second stamps set of Dinosaur is expected in November this year. It is from the 1962 Welfare set and depicts an ammonite fossil. Even though this could be an entry in our plain stamps thread, I think it's actually very striking. The stamp is part of set of 5 values, depicted various trasure of Dutch museums. 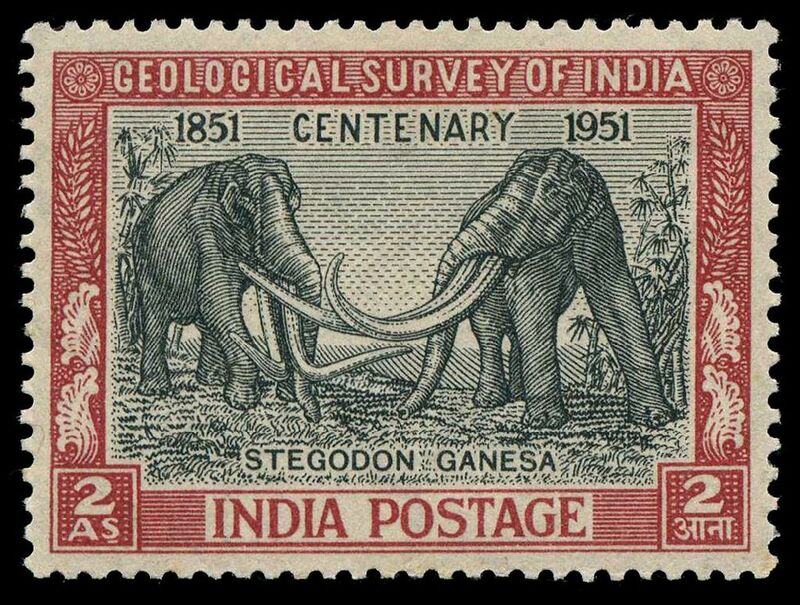 Hope to see some fossils or prehistoric animals stamps of Netherland in the feature. From the 1988 welfare funds set.